Brooches, pins, and fibulas can be defined within two overlapping categories of dress, as both functional and decorative items. Historically, they are primarily defined as utilitarian, as clasps and fasteners for use in closing garments on the body or in holding pieces of a garment together. They were also designed or used as personal adornment with ornamental features that communicate ideas about the wearer, and the wearer's period and milieu. The word "pin" carries the most broad and general usage that includes brooches and fibulas. However, fibula is most sharply defined within its historical usage while the meanings of pins and brooches have a much wider scope over time. The common element among all three is the more general fastening function of the pin. Historically, these fasteners did not have gendered associations, but in contemporary usage women wear brooches as purely decorative pieces of jewelry. 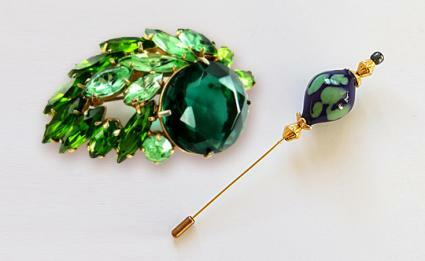 In the early 2000s, while the word "brooch" could be used synonymously with "pin" as jewelry, pins were more commonly understood to be small, sharp, metal-wire fasteners called "straight pins" and used in sewing and tailoring processes, unless modified by a descriptive prefix such as in "hatpin." A pin is broadly defined as a straight, cylindrical piece of metal with a sharp point on one end and a blunt head on the other, used for fastening by piercing a piece of fabric twice. Throughout history and around the world, in their most simple shape and function, pins have been made in various sizes and from such diverse materials as bone, thorns, bronze, iron, brass, silver, and gold. The heads of larger, specialized pins used as elements of dress, such as hatpins, tiepins, and hairpins, have been elaborately decorated with gemstones and other jewelry techniques to create designs appropriate to their period. For example, long and elaborate hatpins secured European and American women's hats to their hair in the seventeenth and eighteenth centuries, and in the Victorian period through the 1930s. Combining materials such as glass, beading, gemstones, pearls, or various metals, these hatpins may be described as small, precious sculptures. In contrast, smaller straight pins with a flat head have been important as fasteners for women's dress. In the Renaissance, for example, a woman might have been pinned into her bodice, rather than laced or buttoned, for a tight, smooth fit. In several periods of dress history, items such as aprons were pinned to a woman's outer garment. In the nineteenth century, in fact, the word "pinafore" was coined to describe the washable aprons pinned to the front of women's and girls' clothing to protect them from stains while working or playing. The kilt pin is a contemporary example of old-style pins worn to display one's ethnic identity. Plaid kilts from Scotland, Ireland, and Wales are fastened with a large, sword-shaped pin made from metal, horn, or wood and embellished with Celtic-inspired motifs or cultural icons such as the thistle. 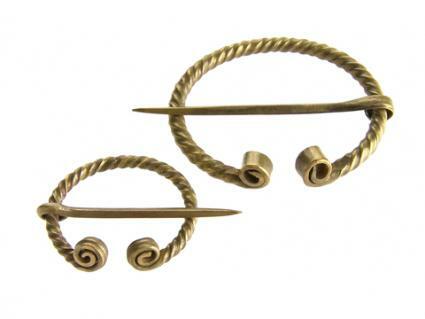 Kilt pins might also be decorated with a clan badge to display the wearer's ancestry. The fibula is defined as an ancient or classical period clasp for fastening garments with a simple pin, spring, and catch-plate mechanism. The structural design of a fibula resembles that of a modern safety pin in that the wire pin is extended from a small coil of wire on one end that acts as a spring or hinge. This allows the pin to be opened and closed numerous times without breaking. The coiled spring also puts the pin under tension and secures it in the catch-plate on the other end. This integrally hinged pin structure is technically called an acus. Because of their resemblance, the safety pin is often said to have developed from the fibula. However, it is a simple, functional, and very common mechanism that has been used for millennia in many forms. The most recognizable forms of ancient fibulae are the elaborately decorated, bow-shaped clasps of Greek, Etruscan, or Roman periods, with long thin sheaths covering the pin. Archaeological examples show they were made of gold, silver, and bronze and variously worked with filigree, enamel, repoussé, and granulation techniques, or embellished with gemstones. Several fibulae were required for Greek women to fasten the style of tunic called an Ionic chiton across her shoulders and upper arms. A number of varieties of Byzantine, Anglo-Saxon, and Romano-British fibulae have been found. The use of fibulae declined as the rectangular, draped styles of clothing gave way to the cut-and-sewn tunics of the early medieval periods. Fibulae are seen in use again as translations of the Classical styles during the Renaissance in the fifteenth and sixteenth centuries. Small, jeweled clasps or the gold points called aglets or aiguillettes were pinned to hold paned or slashed fabrics together on the sleeves, bodices, and doublets of fashionable upper-class garments. In the early twenty-first century, pairs of large, worked-silver clasps are used by women of nomadic groups in North Africa to close their cloaks and wrapped garments. While the European word "fibula" is used to describe them, they are not called such in indigenous use. For example, in Morocco they are called tizerzai. These clasps do not resemble ancient fibulae in appearance or structure. One style is made with a long pin hinged onto an open circle so that it slides. As the pin is pushed through the fabric, the circle is turned and one end is caught under the pin to hold it firmly in place. These fibulae, as a form of jewelry, are important elements of women's dress and reflect the wearer's social status and wealth in terms of their size, weight, and amount of silver used, and in how elaborately they are worked. If safety pins are seen as a direct descendant of the fibula, one example of their use from contemporary dress should be mentioned, specifically, the use of safety pins in body-art piercings by punk youth subcultures in the 1970s and 1980s. Safety pins, as common, inexpensive, throwaway items, brought vernacular antifashion statements into play. In the 1990s, these ideas were extended to embellishing torn garments with patterns of multiple safety pins in both street dress and popular fashion. High-fashion designers such as Gianni Versace and John Galliano, referenced these street styles and embellished many designs with safety pins. A brooch is broadly defined as a large decorative clasp or pin, but it may be more specifically defined as a clasp with either a fixed pin attached to the back or a hinged pin and catch-plate on the back. The brooch has a long history as a functional clasp with great ornamental importance as a piece of jewelry. The body of a brooch can take many sizes and forms, and types of brooches can be based on specific shapes, such as bars, closed circles, rings, open or penannular circles, bows, knots, hearts, or crosses, or designed with more abstract forms. As with any piece of jewelry, the design, materials, workmanship, and forms of embellishment communicate many ideas about the wearer, and the wearer's period as well as culture, religious, fraternal, or guild affiliations and social or economic position. 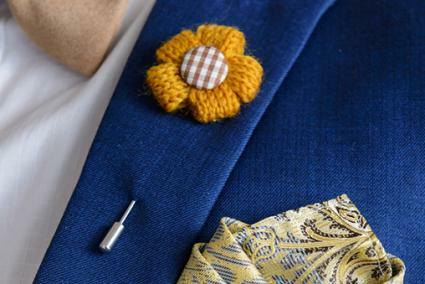 The style of brooches and design changes with cultural and fashion changes and trends. The ancient brooch was often the focal point of an ensemble. Early brooches were large and made from sturdy metals such as bronze or silver to secure heavy wool or leather cloaks. As such, they also represented one of the most important and valuable objects of material culture and were buried with their wearer. In the early Middle Ages, brooches were the most widely used form of jewelry for European ethnic groups such as Germans, Lombards, Franks, and Anglo-Saxons. For all of these reasons, many ancient brooches have survived. European men and women in the tenth through thirteenth centuries wore a round brooch called a fermail or afiche to fasten their outer mantle or surcote. Religious uses include the medieval pilgrim badges sold or given to visitors at a shrine. Made to meet different levels of expense, they were worn as evidence of a successful pilgrimage and as a protective charm. In the sixteenth century, these badges inspired a type of round brooch called the enseigne, pinned by Italian men on the upturned brim of their hats. By mid-century they were worn throughout Europe by both men and women. Enseigne were upper-class brooches made from gold, encircled by gemstones, with enameled designs or carved cameos in the center representing a biblical or patron saint's theme. Other specialized types of brooches include mourning brooches worn from the time of the Middle Ages in memory of a deceased loved one. In the nineteenth century, these preserved a lock of the beloved's hair behind a crystal or glass cover. After the early twentieth century, brooches were primarily categorized as costume jewelry worn by women for decorative reasons. Late-twentieth-century trends included wearing brooches from folk or ethnic dress to denote ethnic identity or to display cultural heritage. For instance, a large, round brooch called the sølje is considered the national jewelry of Norway. Its lacy filigree style is worked in silver, pewter, or gold and embellished with small, movable, concave metal disks that resemble a spoon bowl. It was originally worn in Norway, through the nineteenth century, as part of folk-dress ensemble by a bride, but by the early 2000s was worn by European and American women to show Norwegian heritage. Replicas of ancient Celtic brooches are also worn by men and women with plaid kilts and sashes from Scotland, Ireland, and Wales. See also Costume Jewelry; Jewelry; Safety Pins. Borel, France. The Splendor of Ethnic Jewelry: From the Colette and Jean-Pierre Ghysels Collection. Translated by I. Mark Paris. New York: Harry N. Abrams, 1994. Evans, Joan. A History of Jewellery, 1100-1870. London: Faber and Faber, 1970. Gregorietti, Guido. Jewelry through the Ages. Translated by Helen Lawrence. New York: American Heritage Press, 1969. Hackens, Tony. Classical Jewelry: Catalog of the Classical Collection. Providence: Museum of Art, Rhode Island School of Design, 1976. Heaton, Harriet A. The Brooches of Many Nations. Nottingham, U.K.: Murray's Nottingham Book Co., 1904. Jereb, James J. Arts and Crafts of Morocco. San Francisco: Chronicle Books, 1996. Newman, Harold. An Illustrated Dictionary of Jewelry. London: Thames and Hudson Inc., 1981. Tait, Hugh, ed. Seven Thousand Years of Jewellery. London: British Museum, 1986.